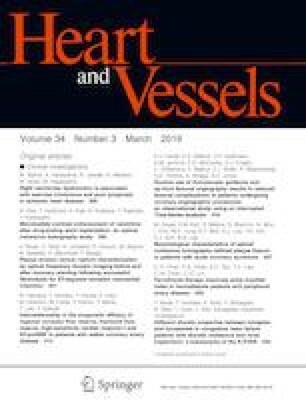 Histopathological assessment of the pulmonary arteries is crucial to determine the surgical indications in patients with congenital heart disease (CHD) and intractable pulmonary vascular disease (PVD). We aimed to clarify whether pulmonary hemodynamic parameters can predict PVD in patients with CHD and pulmonary arterial hypertension (PAH) We performed histopathological evaluations of lung specimens and cardiac catheterizations in 27 patients with CHD–PAH. We divided these patients into the patients with and without PVD, and compared pulmonary hemodynamic parameters including pulmonary arterial compliance (Cp) between two groups. Age at lung biopsy was 4 (2–7) months. There were 16 patients with trisomy 21. Cardiac diagnosis included ventricular septal defect in 16, atrial septal defect in 5, atrioventricular septal defect in 4, and others in 2. There were 11 patients with histopathologically proven PVD (Heath–Edwards classification grade ≥ 3 in 5; the index of PVD ≥ 1.1 in 3; extremely thickened media in 6; hypoplasia of the pulmonary arteries in 3). Cp in the patients with PVD was significantly lower than that in patients without PVD (0.99 [0.74–1.42] vs 1.56 [1.45–1.88], p = 0.0047), although there was no significant difference in the ratio of systemic to pulmonary blood flow, pulmonary arterial pressure, and resistance between two groups. A Cp cutoff value of < 1.22 ml/mmHg m2 as a predictor of PVD yielded a sensitivity and a specificity of 93% and 64%, respectively. Pulmonary arterial compliance can be a predictor of PVD among patients with CHD–PAH. There is no conflict of interest for all authors. No funding was secured for this study.